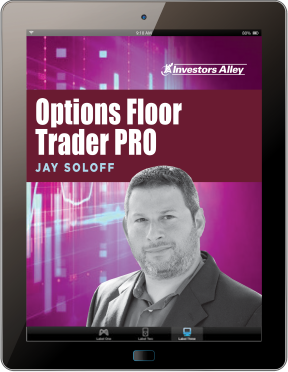 Options Floor Trader PRO is the entry point to your next profitable option trades. You’ll use the same strategies I used myself on the floor of the CBOE. In no time at all you’ll feel like a pro yourself once you start. The goal of Options Floor Trader PRO is simple: take you from a beginner option trader with a small account to a confident option trader with a larger account. To help you get started and make sure there’s nothing in the way I’m offering charter memberships at the lowest price you’ve likely ever seen an options trading service offered. Now accepting new members! Click here. Options Profit Engine is a new kind of options advisory service delivering bring professional level research and trading strategies to individual investors. This is the brainchild of expert options trader Jay Soloff who previously was market maker at the Chicago Board Options Exchange for some of the biggest companies listed. 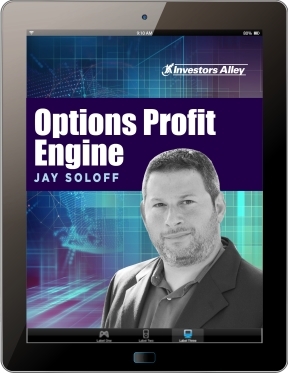 Now Jay’s making his trading secrets – the ones that made him a highly sought after trader – available to you with Options Profit Engine. With Options Profit Engine you’ll get weekly options trade set-ups for any market condition using Jay’s proprietary trading strategies. You’ll also benefit from his Options Volatility Analyzer, Call / Spread Trader, Iron Condor Weekly Alerts, and much, much more. The Automatic Income Machine is a new kind of disciplined, step by step wealth-building system designed for serious investors. The objective is to provide you with a realistic, proven way to grow a small amount of money into a decent-sized portfolio that can support you and those you love for the rest of your life. Automatic Income Machine is specifically tailored to those investors who have already saved up at least $50,000 for retirement and now want to accelerate the growth of their next egg. This is not an investing course, software system, or tip sheet. Live Monthly Strategy Sessions for investors to review in detail the investing strategy over the next 30 days live with Tim and other subscribers. Get actionable recommendations and ask questions and get real time answers. Analysis of Growing Dividends Portfolio Construction for those investors who may want to apply to their own stocks the same techniques use for portfolio growth in the Automatic Income Machine. IRA and retirement account friendly recommendations for those looking for tax advantaged returns without all of the IRS paperwork. Click here for Tim’s special dividend investing training video. A high-yield income and dividend service dedicated to bringing you the very best dividend income opportunities available (current average yield of the portfolio is around 8%). 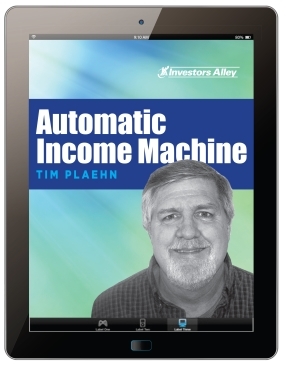 With each issue editor Tim Plaehn uses his unique cash flow analyzer system to bring you in-depth research on dividend investments for not only high yield but dividend growth as well. Anyone can find high yield stocks, but Tim goes the extra mile to find those that can sustain their dividend payments and have a management team with a commitment to increasing dividend payouts. These are the kinds of investments you can rely on for steady income month after month, quarter after quarter, and year after year. Tim’s developed a new monthly dividend system called The Monthly Dividend Paycheck Calendar. It’s specifically tailored to investors looking for steady monthly income from stable dividend stocks. The Monthly Dividend Paycheck Calendar is set up to make sure you’re getting 6, 7, even 8 dividend paychecks per month from stable, reliable stocks with high yields. And it ensures that your dividend stock income stream will be more stable and predictable as you’re getting payments every month, not just once a quarter like some investors do. The Calendar tells you when you need to own the stock, when to expect your next payout, and how much you could make from stable, low risk stocks paying upwards of 8%, 10%, even 17% in the case of one of them. Tim’s done all the research and hard work; you just have to pick the stocks and how much you want to get paid. Click here for details on how to get started. Current subscribers to The Dividend Hunter click here to log in. As a new and innovative approach to income generation, 30 Day Dividends seeks to reward investors with steady income using conservative short duration covered call trades. 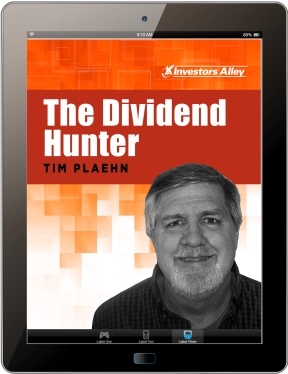 This service from Tim Plaehn, known for his work with The Dividend Hunter, employs a strategy of event based trades on certain dividend stocks with Jay Soloff’s deep understanding of how to play some of the fastest moving stocks in the market. The objective is to deliver quick gains that are anywhere from two to four times greater than the published dividend yield… and in many cases actually collect the dividend as a bonus to the gains from the trade. Even with the market turmoil of fall 2018 their track record is the envy of traders everywhere: 34 winners out of 36 trades for a win-rate of 94%. 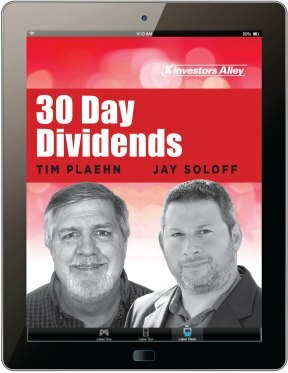 30 Day Dividends is currently closed to new memberships. Watch this space for more details. The Growth Stock Advisor is a balanced portfolio approach to high and medium growth stock investing. The core portfolio consists of around 20 positions spread between core large cap stocks for steady growth, dividends, and protection from market downturns and a group of small and medium cap stocks to take advantage of sector moves and secular tailwinds. This balanced approach lets you ride the smaller stocks to double and triple digits gains while the larger stocks ground the portfolio for long term growth. 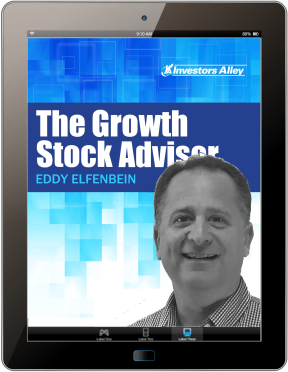 Each issue of Growth Stock Advisor brings you independent, detailed research on the kinds of stocks you’ll want to hold in your portfolio for a very long time. Current subscribers click here to log in. Tony Daltorio’s Growth Stock Confidential starts with the stocks and trends he finds in his research for Growth Stock Advisor and then goes deeper and further upstream if you will, to find the stocks and companies that are the next level up from growth stocks. While many newsletters claim to bring you unique investing ideas you won’t hear from in the mainstream financial press, Tony actually delivers. For example there’s the publicly traded company that has cornered the market on cobalt – a key ingredient where high-temperature strength is important, like electric vehicles – and yet is not a miner or supplier. Or the company run by a man referred to as Canada’s Warren Buffett. Each month you’ll receive a new and exciting investment recommendation that could quite literally be life-changing in an easy to read, commonsense approach from Tony. And he’ll also provides you with a mid-month update on portfolio stocks on the move so you don’t miss any of the action. Growth Stock Confidential will soon re-open to new members. Watch this page for updates.